1 of 3 In a medium-size saucepan, heat oil over medium heat. Add onion, garlic, red pepper flakes, oregano and chile powder. Cook, stirring, for 5 minutes or until onions and garlic are softened. 2 of 3 Add 3 cups water, lime juice and salt. Bring to a simmer over medium-high heat. Add chicken and cook 12 minutes, or until cooked through. Remove chicken to a cutting board and let cool slightly. Using an immersion or upright blender, puree onion mixture until smooth (do this carefully, as mixture will be hot). Return to saucepan; add tomato sauce. Cook 5 minutes over medium heat. 3 of 3 Meanwhile, shred chicken into bite-size pieces (you should have about 2 cups). Pit avocado and reserve half for another use. Cut remaining half into chunks. Place about 1/2 cup shredded chicken into a bowl. Ladle 1-1/4 cups soup into bowl. Top with 1/4 of the avocado pieces and 2 tablespoons shredded cheese. Sprinkle with 1 tablespoon tortilla strips. Repeat for all servings. 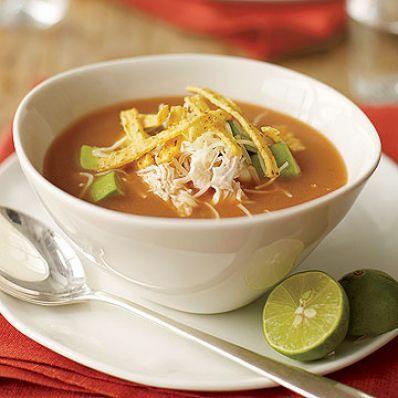 1 of 1 Instead of tortilla strips, crush a few tortilla chips over top of soup.